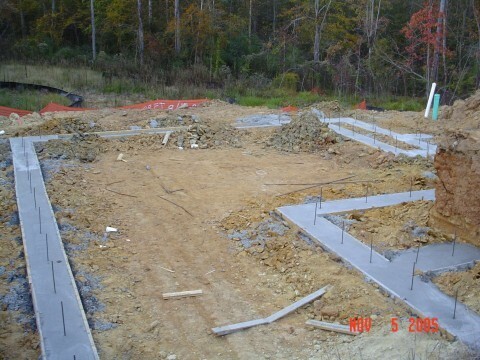 Concrete footings are the portion of a foundation that hold the whole weight of the building. This footing is fairly shallow. 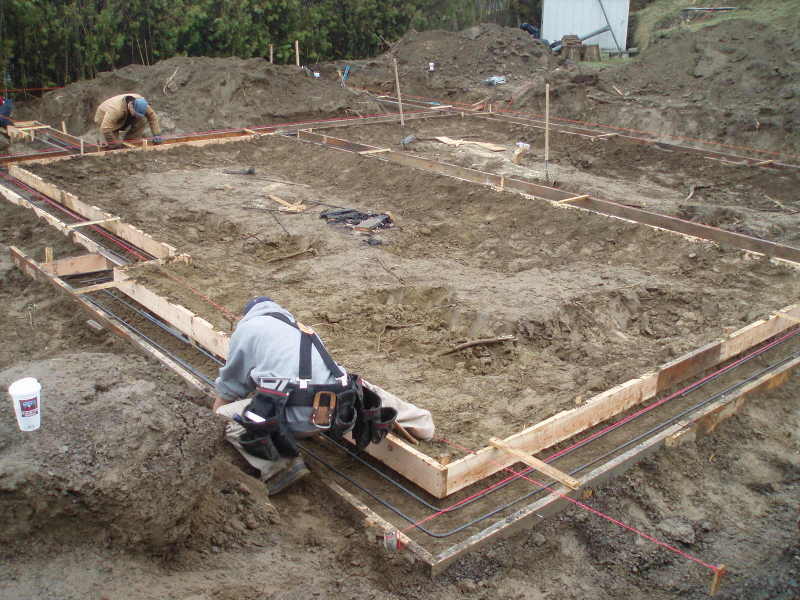 Each area and home will have specific requirements for footing width and depth. These will depend on existing soil conditions and house design. A two story home typically has a deeper footing because of the increased load on the footing. Next we have a poured footing. Note the rebar that is coming up from the concrete. This will help secure the stemwall to the footing. If the stemwall is block, The cells will be filled with concrete. The stemwall can also be formed up and poured solid. I was surprised by how much reinforcing steel was used on this building. Either there are some extreme issues, possibly an earthquake zone, soil conditions, OR this is a multi-story building. It may be a large residence or a small apartment building. Note how thick the slab will be. Most homes have slabs that are 4-6 inches thick. It is also a monolithic slab . The footing and slab are poured all at once. This is very often done in areas with seismic activity. 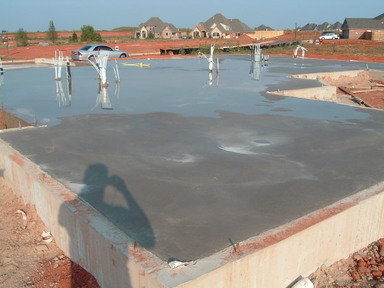 The slab has just been poured. 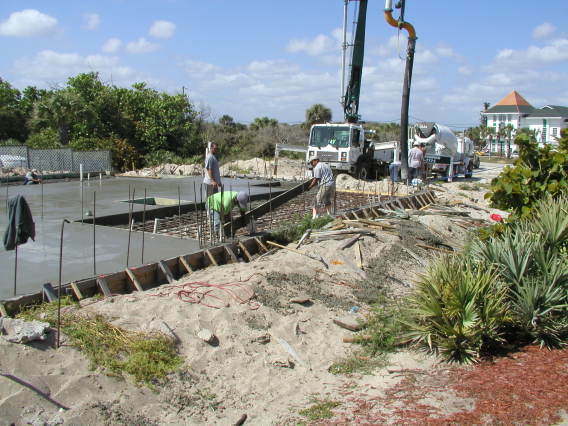 An owner builder should make sure that fresh concrete is protected from harsh elements. Drastic changes in temperature can cause extensive cracking early in the curing process. The stemwall to this specific project was poured in place. Remember, very often the garage is poured separately from the slab. In fact, It may require an additional inspection. Here, the forms for the main slab are being stripped so crews can pour back the garage concrete. It looks like the slab was finished earlier in the day. This is ideal if possible, to pour the garage and slab in the same day. It reduces the cost of recalling a boom truck or concrete crews. 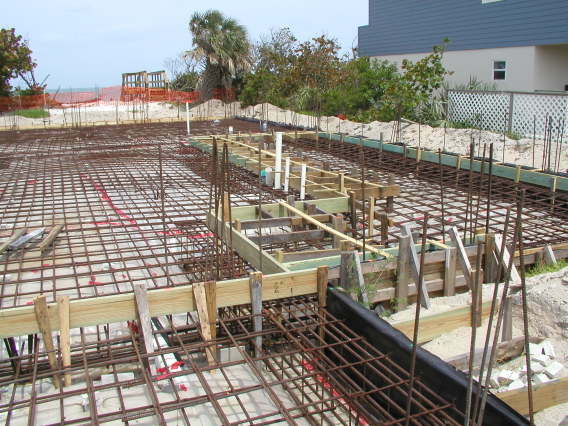 The concrete slab is just one portion of the building process.